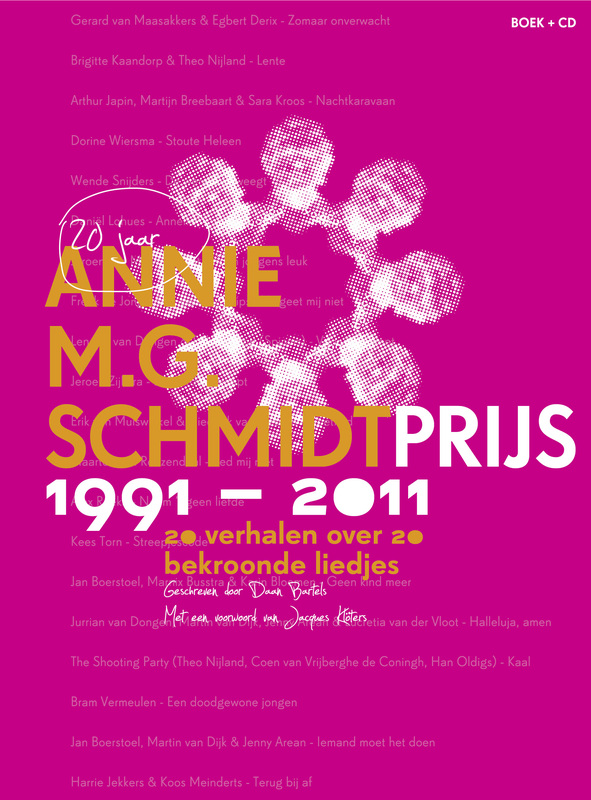 This lovely book with 20 interviews plus a CD, marks the 20th anniversary by the Amsterdams Kleinkunst Festival and BUMA Cultuur of the "Annie M.G. Schmidt Prijs" in the Netherlands. This annual award is a prestigious one in the Dutch cabaret world. In 2012 the 20th award will be handed out. Cabaret connaisseur Daan Bartels interviewed nearly all the award winners about their winning song. Bartels wrote 20 stories that give a surprising inside look of how these special songs came about and what they have meant to their creators and performers alike. The "Annie M.G. Schmidtprijs" is an award for the best theatre song of the year. It is not only given to the performing artrist of the song but also to the text writer and the composer as well. Through the years the winners of this award have been for instance: Karin Bloemen, Maarten van Roozendaal, Daniël Lohues, Wende Snijders and Brigitte Kaandorp. This year the winner is Gerard van Maasakkers with the song 'Zomaar Onverwacht'!